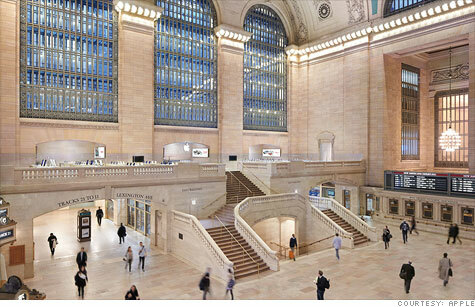 Apple's Grand Central Terminal store in New York will be the site of a protest on Thursday from customers seeking reforms in how Apple's overseas suppliers, like Foxconn, treat their factory workers. NEW YORK (CNNMoney) -- Apple is facing demonstrations on Thursday at a half-dozen of its retail stores around the world from customers concerned about how Apple's suppliers treat their factory workers in China and other overseas locations. The protests are the offline outgrowth of an online petition drive launched two weeks ago on social activism site Change.org. Created by Mark Shields, a self-described lifelong Apple customer who says he was "shocked to learn of the abusive working conditions in many of Apple's supplier factories," the petition has drawn almost 200,000 signatures since its launch. A parallel petition effort, led by corporate accountability lobbying group SumOfUs.org, has drawn another 50,000 signatures. Both groups are teaming on Thursday's protest. Supporters plan to hand-deliver copies of the petitions -- including all of the signatures -- to workers at a half-dozen Apple retail stores around the world. The targeted stores include marquee locations in Washington, DC; New York City, San Francisco, London, Sydney and Bangalore. "This is a really huge step for us, in combining all of the voices we've collected from people all over the world asking Apple to clean up their supply chain," Change.org human rights organizer Sarah Ryan told CNNMoney. An Apple spokeswoman declined to comment on the planned action. Ryan said she expects around 40 people to join the protest at one location, Apple's Grand Central Terminal store in Manhattan. The petition delivery is scheduled to begin at 10 a.m. ET. Change.org's petition asks Apple (AAPL, Fortune 500) to develop a "worker protection strategy" around its major product releases to prevent the abuses that have reportedly occurred when major deadlines loom. It also asks Apple to be transparent about the findings of the Fair Labor Association, an independent watchdog group that Apple joined last month. The FLA plans to begin monitoring the facilities in Apple's supply chain and to publicly post its findings on its website. SumOfUs's petition is less detailed and more sweeping. Calling for an "ethical iPhone," it asks Apple CEO Tim Cook to "overhaul the way [Apple's] suppliers treat their workers." Horror stories have kicked around the tech industry for years about the conditions at the Chinese factories almost all major U.S. vendors rely on to manufacture their devices. The pressure has intensified recently on Apple -- the industry's most profitable and most popular gadget maker -- after a series of investigations drew attention to a set of particularly chilling alleged labor abuses. An investigation by the New York Times shed light specifically on the harsh working conditions at Foxconn, a key Apple supplier. A story published late last month documented the human toll of a plant explosion that killed several workers. In a recent CNN segment, a Foxconn employee spoke out about her working conditions. "They use women as men and they use men as machines," the worker -- who asked to remain anonymous -- told CNN's Stan Grant. "I almost feel like an animal." When asked why humans do machine-like work at Foxconn, she responded: "Well, humans are cheaper." The Foxconn worker said that she made less than $1 an hour for her labors. While Apple declined to talk about this week's protests, the company reaffirmed its commitment to fair labor practices. "We care about every worker in our worldwide supply chain," Apple said in a recent statement to CNN. "We insist that our suppliers provide safe working conditions, treat workers with dignity and respect, and use environmentally responsible manufacturing processes wherever Apple products are made." Apple is one of many companies that outsources its electronics manufacturing to suppliers across the globe. Change.org organizer Ryan said she hopes that garnering attention around the petition will push Apple to set a precedent for other tech companies. "What we want is for Apple to take their motto -- 'think differently' -- and extend that to the way they treat their workers," she said. "We want them to be a leader in the tech world in not just treating their workers in the United States fairly, but also treat the ones abroad fairly."